When the topic of vision loss in the workplace comes up, a discussion about suitable careers for people with vision loss typically ensues. These career options can sometimes feel limiting because we live in a very vision-centered society. Reflecting back on my past employment experiences, I have definitely not chosen visually easy ones. This is not at all to pat myself on the back in the bravery department, as I honestly didn’t really think the visual challenges through until I was thick in the midst of them. I simply followed my interests, which is how I ended up as a foster care case manager at age 22, a position that required more driving than most UPS delivery employees. For a person without a driver’s license, that’s a bit of an issue, especially since it was before the days of Uber in a suburban setting where “mass transit” involved a fleet of soccer moms in mini vans. The position also involved transporting minors that were wards of the state, so I couldn’t exactly pick them up in taxicabs, though the cab fares probably wouldn’t have covered my social service salary anyhow. I had to get creative and ended up on trains (for the occasional urban trips), planes (for court-ordered, out-of-state sibling visits), and automobiles of individuals willing to be fingerprinted, including my generous husband! Photo description: Joy sitting on a chair, speaking to a group of children around her on the floor in a classroom. Eventually, my interests and sanity needs led me to the classroom, which eliminated the transportation dilemmas but of course presented challenges of its own; as there are no training handbooks for managing a classroom of hormone-hyper 7th graders using non-visual techniques in an educational setting accustomed to visual methods such as hand raising. For someone with 4 degrees of peripheral vision, spotting a raised hand in a packed classroom is a bit like playing Yahtzee: there is a touch of skill involved but mostly a whole lot of luck. Of course, I created alternative management methods, such as assigning a class “caller” or giving students noisemakers in lieu of silent hands (in hindsight, not my brightest idea, but teachers in their 20s have to learn the hard way sometimes). Fast forward to this past spring, when I was checking my e-mail before going to bed (a habit I’m trying to break) and saw a message that made me sit straight up in bed and elbow my husband. “Oh my gosh, babe, listen to this new internal job posting!” It was for a “student support coordinator” at the charter school where I was working part time. The position said it involved meeting with parents and teachers of struggling students in order to recommend interventions. But the part that most drew me to the position was that it involved creating 504 plan accommodations for students with various disabilities. “Wow,” my husband elbowed me back, “that sounds perfect for you. You’ve been dealing with accommodations your whole life.” He was right, and as a general education classroom teacher, I always felt a certain connection to the students who had extra challenges, though I never wanted to be a special education teacher. I’ve always identified more with students who are completely capable of doing grade-level work when given the right accommodation because it’s so similar to my own story. I can perform just as well as any classmate or co-worker when accommodations are in place. I began drafting a cover letter that very night (hence, the reason you should never check e-mails before bed unless you plan on staying up until midnight). I notified my current director, who wrote a recommendation letter, and started prepping for the interview. Even though I’ve written posts and published articles on the benefits of hiring people with disabilities, old stories of inadequacy and blind shame surface at the most inconvenient times. The team gave me several scenarios, which they both read aloud and put up on the screen I tried zooming my screen in but still could not read the scenarios very well, so I tried to just focus on their words even though my brain felt engulfed with fog. I took very long pauses and admitted that I didn’t even know what tier 1 and 2 interventions were! The only question I felt completely confident and articulate answering was the difference between modifications and accommodations. My stomach muscles knotted up as I realized I was majorly stammering through my answers, talking in circles. Was I making any sense at all? I felt relief when the interview ended but immense disappointment over how it had gone. So I was completely shocked the next morning when I received an e-mail from the director, saying she’d like to talk about the position in more detail. It turns out that the interview team liked that I had some background in social work in addition to education. This is a very involved position,” she said, “it’s full time, and there’s a lot to it.” She suggested I take the weekend to think about it and consider the impact on my current obligations. Had I just been offered the job?! I mulled it over for about 5 seconds before deciding it was for me. I didn’t overthink the visual challenges that surely were ahead. In honor of our 40th birthdays, we’ve come up with 4 lessons we’ve learned over our 40 years of growing and living with sight loss. Knowing when to lead and when to follow is part of finding your ease. 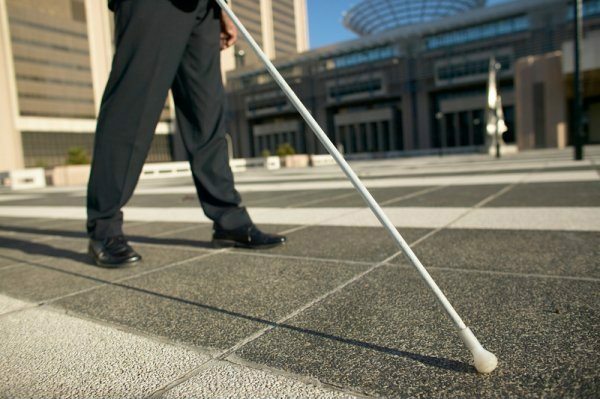 Mobility for people with vision loss can bring up tricky questions like: Should i use a cane even though I can see decently well at times? Would a guide dog help me move about more quickly and easily? Should I take someone’s arm as I walk into the restaurant tonight? How should I respond when someone tries to grab my arm and steer me around or offers unsolicited help? Learning when to lead and when to follow is part of the journey. Insight is one of the strongest forms of seeing. Our society places a lot of importance on physical sight, yet when we use our “third eye” to look inward, we can see ourselves and the world around us in new and beautiful ways. It takes a little bit of silence, a little bit of stillness and a whole lot of practice to find vision in the non-physical. Dishwashers should never be left open. Our shins have 40 years worth of stories to tell. I recently saw the motion picture premiere of Madeline L’Engle’s infamous A Wrinkle in Time, and was reminded of the rich wisdom enclosed in this childhood classic. I first read this story at age 10, during a time when I already knew there was something different about me compared to kids my age. I felt an immediate connection to the characters in this story, especially Meg – stubborn, caring to a fault, and easily angered by questions that didn’t seem to have concrete answers.